Have an urban experience in quaint historic Downtown Edmond, OK. This urban townhouse was built in 2017 for this very purpose. Walk to the University of Central Oklahoma, The Patriarch, The Zu, UCO Jazz Lab and enjoy all the amenities of our walk-able environment. The second story townhouse is new and furnished to provide the guest an urban experience. Guests have the entire townhouse and access to a wonderful courtyard with fire pit. The neighborhood is unique because it is walkable and bikable with many restaurants, bars, and other entertainment options within walking distance. I am a professor at the University of Central Oklahoma. I teach real estate and run a local real estate brokerage. I am passionate about creating place and walkable urban environments. This property was built specifically to do nightly rental and give the guest an urban experience in a quaint suburban environment. The best amenity is the proximity to wonderful Downtown Edmond and the restaurants, bars and entertainment. 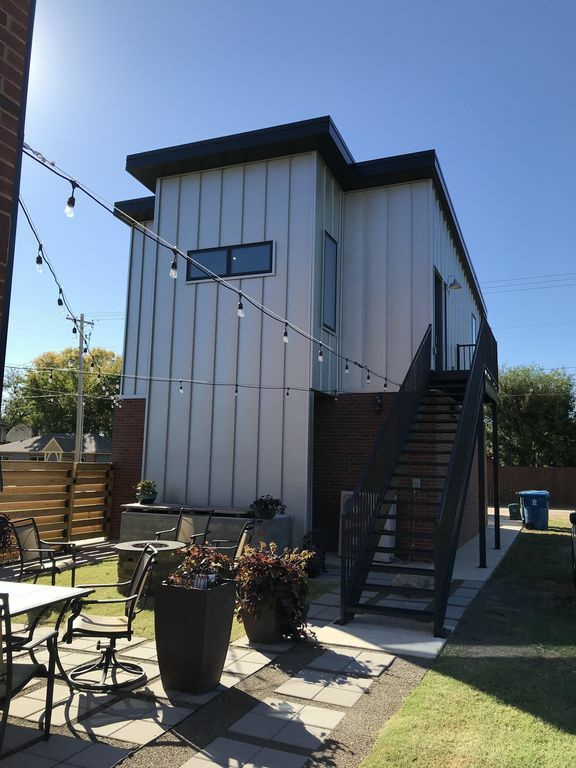 Really cool place in a wonderful downtown.The best amenity is the proximity to wonderful Downtown Edmond and the restaurants, bars and entertainment. Living room has a couple chairs and sofa. Kitchen is well equipped with stainless steel refrigerator, stove, dishwasher, microwave, Krieg coffee machine. Small antique, dairy bar table with 4 chairs. Sorry. This is a second floor garage apartment/townhouse. The best amenity is the proximity to wonderful Downtown Edmond and the restaurants, bars and entertainment. We were very happy with this rental, the location, the accomodatiions & host! We felt so comfortable there! Our visit to Edmond was wonderful and filled with great memories! We really appreciated having such a great place to stay & plan to rent again when we return for another visit. Thank you! My husband and I had a great stay at the Hurd House. It was a quaint 1915 home with so much detail - it was extraordinary to be living in a part of history. The home was in great condition and has all the necessary upgrades. It was clean and comfortable. The owner is incredibly accessible and helpful. If you stay and you need anything, don’t be shy, just ask and he will accommodate you within reason (I am assuming there is something he’d decline but didn’t run into that). There is plenty of cooking and eating space. All the necessary utensils and linens are provided. Right outside the front door is a very short walk to Downtown Edmond. There are a lot of food and drink options and some very nice boutique shopping options. The internet works well. There is a TV w local chant and streaming ability - just login with your acct and remember to logout before you leave. The one bit of info I will offer is the train that is a few hundred feet from the house - it travels through those tracks regularly, including the nighttime. My husband and I both grew up close (not this close, but close) to trains so it didn’t bother us much, but if you aren’t accustomed, this may be a problem for you. If you’re looking to be in Downtown Edmond, I would struggle to suggest a place where the train would not be heard, however. The train just comes with the town. This house was perfect for us. We were visiting for a long weekend (4 nights) from Phoenix for a wedding. My brother lives in Dallas and flew in for one night and we were able to accommodate him without any problems. It was close to where we needed to be and had so many food options right outside the door. I loved my stay here and will definitely return. The Chapman house was a perfect spot for our vacation. Loved the design and decor. Beautiful place with great accommodations. Edmond was a fun town to explore, everything pretty much within walking distance to downtown.